The Originals! 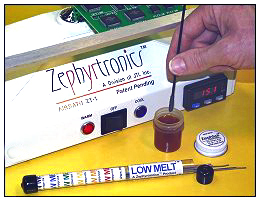 No One Knows More About Preheating PCB's Than Zephyrtronics®! Bottom-Side Convection PCB Pre-Heat for Thru-Hole, SMD, SMT, QFN & BGA Rework & Repair. Our Heavy Industrial Series! This is the world-first, original and, internationally acclaimed, award-winning and patent-protected ZT-1-HIS Heavy Industrial AirBath™ preheat system -- your effective solution for preheating PCB's for low-volume prototyping or in rework. Two Models! Our ZT-1-HIS AirBaths™ are available with either analog or digital control. Both models have powerful 25 CFM (710 Liters/Minute) of air supply. Greater volume of air supply preheat with far lower temps than with other ineffective preheat devices limited by low air volume outputs, which require higher temps and burn your boards. Not a preheating "toy", this is real preheating! And in our famous trademark pyramidal design! 800 Watts of Power: Coupled with our ample air output is our 800 Watts of preheating capacity. This is effective preheating by design! years on the market and a 1 year warranty (see details below). Preheat Power: Our ZT-1-HIS AirBaths™ ample air supply from the AirCone™ delivers its forced-convection preheat power for even the most challenging PCB's. Beware of imitative pre-heaters with less than 13CFM (360 liters/minute) that crudely attempt to compensate for wimpy air volume through higher temp settings. Remember: the glass transition of a FR-4 PCB is only 170°C. You don't want higher preheat temps, you want higher volume of safe preheat (100°C-170°C). So Many Features: The AirBaths™ with the Zephyrtronics ZeroTouch™ preheat get into a PCB's nooks and crannies where hot plates and IR preheaters can't go (see videos below). Fabricated from steel, not plastic for industrial use and long production life, they are RoHS Compliant, ESD-safe, exceed U.S. Military Specs and uniquely feature indicator lights (blue: cooling; red: preheating). All AirBaths™ have internal air supply so you do not need compressed air hook ups......and our ZT-1-HIS-DPU Digital Model has our very big LED lighted digital temperature display for quick "set & read" not tiny, impossible-to-read, and simply horrible LCD's for displays!). Thermal Ramping: All AirBaths™ have the industry standard, temperature ramp of 2°-4°C per second "built-in" to prevent thermal shock to semiconductors, sensitive chips, ceramic caps and glass diodes. Indeed, our integrated ramping was essential to Motorola® and Boeing® with their space applications. And they are essential for high-quality smartphone, tablet, pc and flat screen television soldering and desoldering repair. For Thru-Hole, SMT & BGA Preheating Tasks: The HIS Series AirBath Preheating Systems is ideal for all PCB challenges from low-volume production runs, prototyping during design or during rework with all SMD packages such as BGA, CSP, QFP, QFN, TSOP, PLCC, SOIC, SOL, LCC, Flip Chip and Glob Top components. Still, the AirBath is not limited to only SMD devices: Don't overlook the superb benefit the AirBath preheating boost brings to your tough through-hole (PTH) soldering and de-soldering tasks! Plus, it easily handles all substrates including FR-4, polyimide, composites, flex circuits and ceramic boards. The HIS Series of AirBaths™ is available in two models: Analog and Digital. Both models feature variable temp selection from ambient up to 205°C and feature closed-loop feedback temperature sensing control. The digital model incorporates a digital set/read lighted display that permits single digit/degree incremental temperature selection in the "set" mode and tracks real time temperature at the air exit point above the grids. Our Analog Model provides the two most common preheat settings: 100°C and 150°C. (Not Impossible to Read LCD's!) With Temp Set & Read Functions on Front Panel. 100% Non Contact , SMT Hot Air Solder Reflow With the AirBath and a Hot AirPencil. Yields Highest Quality Joints. Finally, forced convection preheaters can also multi-task for cooling down PCB's after soldering which is critical to solder joint integrity as the next section explains. Another AirBath™ Advantage: flipping a switch the unit transforms into a post-cooler™ cooling down your PCB, chips and solder joints. PostCooling™ is essential to soldering BGA's because hot air nozzles must never be lifted from above a BGA until all the balled joints have cooled to prevent unwanted bridging. Important: hot plates, static ovens and IR plates do not provide the critical post-cooling™ feature standard on every Zephyrtronics AirBath™. 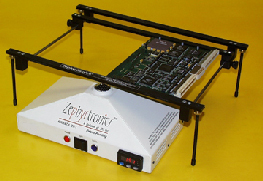 Zephyrtronics Introduced PostCooling™ PCB assemblies to the benchtop clear back in 1994. Our AirBaths™ cool BGA's enough within 8 seconds so a hot air nozzle can be lifted without fear of bridging. Without post-cooling™ techs must wait for the ball/pad interface to solidify completely before lifting a nozzle to inspect. Post-Cooling™ remedies this problem for rapid lifting nozzles off BGA's after soldering. the Standard for PCB Preheating. Our AirBaths™ inspired a lot of cheesy imitations, but we're still the pioneers who understand thermodynamics and preheat better than anyone else. Our AirBaths™ are the intelligent solution to stop burning up your PCB's by preventing thermal degradation, thermal shock, lifted pads or traces, substrate delamination, measling and warping. Twenty Years! 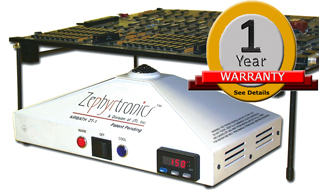 Zephyrtronics AirBaths™ are still the first choice for PCB preheating by most major aerospace and semiconductor manufacturers after two decades. It truly is the one single tool that belongs on every bench. This is the "Science of Zephyrtronics." We have an AirBath™ for you. within our extensive AirBath Catalog. We have an AirBath Preheater tailored to your company's PCB needs.